This article is about the metal alloy. For the sculpture, see Electrum (sculpture). For elektron, the reason for which electricity was named, see Amber. "Green gold" redirects here. For the color, see green-gold. For the Israeli figure, see Greengold. Natural Electrum "wires" on quartz, historic specimen from the old Smuggler-Union Mine, Telluride, Colorado. 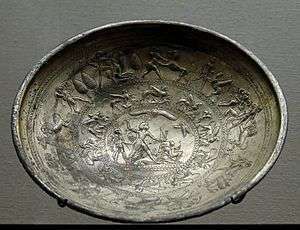 Cup with mythological scenes, a sphinx frieze and the representation of a king vanquishing his enemies. 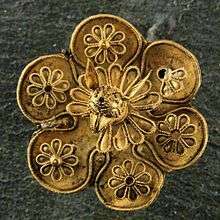 Electrum, Cypro-Archaic I (8th–7th centuries BC). From Idalion, Cyprus. Brooch with a griffin protome. Electrum, c. 625–600 BC. From the necropolis of Kameiros, Rhodes. A mummified male head covered in electrum, dating from the Ptolemaic dynasty of Ancient Egypt (ca. 2nd century CE). Electrum was used as early as the third millennium BC in Old Kingdom of Egypt, sometimes as an exterior coating to the pyramidions atop ancient Egyptian pyramids and obelisks. It was also used in the making of ancient drinking vessels. The first metal coins ever made were of electrum and date back to the end of the 7th century or the beginning of the 6th century BC. For several decades, the medals awarded with the Nobel Prize have been made of gold-plated green gold. The name electrum was also used to denote German ‘silver’, mainly for its use in making technical instruments. The name "electrum" is the Latinized form of the Greek word ἤλεκτρον (èlektron), mentioned in the Odyssey referring to a metallic substance consisting of gold alloyed with silver. The same word was also used for the substance amber, likely because of the pale yellow colour of certain varieties, and it is from amber's electrostatic properties that the modern English words "electron" and "electricity" are derived. Electrum was often referred to as "white gold" in ancient times, but could be more accurately described as "pale gold", as it is usually pale yellow or yellowish-white in colour. The modern use of the term white gold usually concerns gold alloyed with any one or a combination of nickel, silver, platinum and palladium to produce a silver-coloured gold. Electrum consists primarily of gold and silver but is sometimes found with traces of platinum, copper, and other metals. The name is mostly applied informally to compositions between about 20-80% gold and 20-80% silver atoms, but these are strictly called gold or silver depending on the dominant element. Analysis of the composition of electrum in ancient Greek coinage dating from about 600 BC shows that the gold content was about 55.5% in the coinage issued by Phocaea. In the early classical period, the gold content of electrum ranged from 46% in Phokaia to 43% in Mytilene. In later coinage from these areas, dating to 326 BC, the gold content averaged 40% to 41%. In the Hellenistic period, electrum coins with a regularly decreasing proportion of gold were issued by the Carthaginians. In the later Eastern Roman Empire controlled from Constantinople, the purity of the gold coinage was reduced, and an alloy that can be called electrum began to be used. Electrum is mentioned in an account of an expedition sent by Pharaoh Sahure of the Fifth dynasty of Egypt (see Sahure). It is also discussed by Pliny the Elder in his Naturalis Historia. Electrum is possibly referred to three times in the Bible (i.e. if the Septuagint's translation of the uncertain term חַשְׁמַל is accurate). In all three instances it is used to describe a type of glow seen in visions by the prophet Ezekiel (Ezekiel Ch.1 Vs.4 and 27;Ch. 8 Vs. 2). In Lydia, electrum was minted into 4.7-gram coins, each valued at 1/3 stater (meaning "standard"). Three of these coins (with a weight of about 14.1 grams, almost half an ounce) totaled one stater, about one month's pay for a soldier. To complement the stater, fractions were made: the trite (third), the hekte (sixth), and so forth, including 1/24 of a stater, and even down to 1/48 and 1/96 of a stater. The 1/96 stater was only about 0.14 to 0.15 grams. Larger denominations, such as a one stater coin, were minted as well. Because of variation in the composition of electrum, it was difficult to determine the exact worth of each coin. Widespread trading was hampered by this problem, as cautious foreign merchants offered poor rates on local electrum coin.. These difficulties were eliminated in 570 BC when pure silver coins were introduced. However, electrum currency remained common until approximately 350 BC. The simplest reason for this was that, because of the gold content, one 14.1 gram stater was worth as much as ten 14.1 gram silver pieces. ↑ Discussion about the use of terms ‘Electrum’, ‘German silver’, and ‘Nickel silver’ for drawing instruments.